S&P 500 rose 1.9%, led by growth (technology, consumer discretionary) and defensive (real estate utilities) sectors, while industrials cyclicals and financials lagged. The Bloomberg/Barclays Aggregate Bond Index performed in line with U.S. stocks, returning 1.9% while U.S. High Yield returned 0.9% despite some credit spread widening. 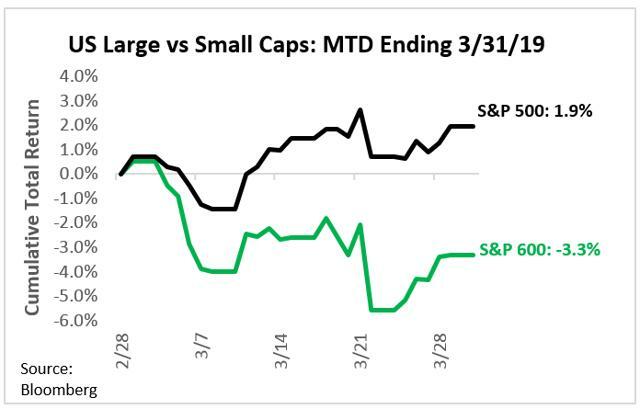 Between the strong performance in U.S. large caps (small caps and value, not so much) and corporate credit along with a bull steepener in the yield curve, we could be seeing a set-up for renewed risk-taking. 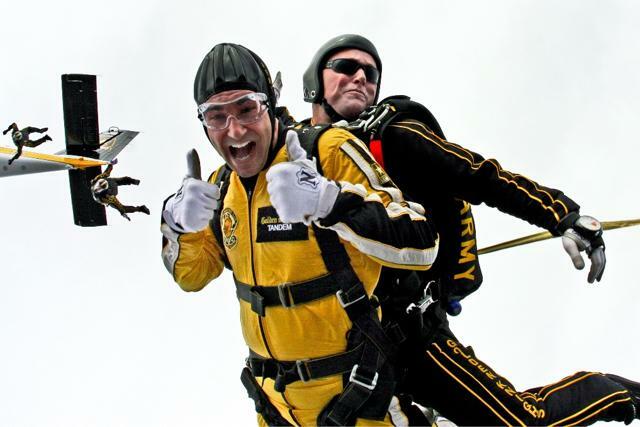 First Quarter 2019 Market Commentary – Pull the Chute! Source: pxhere.com. Labeled for reuse. Plenty of issues surfaced during the first quarter (more on those below) that drove diverging movements between global stock markets (indices strongly up) and global bond markets (yield sharply down). Or so you would think. Watching the Brexit drama play out reminds us of a scene from the 1991 movie Point Break. Towards the end, Johnny Utah (Keanu Keeves) jumps out of a plane, wearing no parachute, to chase after Bodhi (Patrick Swayze). Utah catches Bodhi mid-flight and points a gun to his head demanding information. A ‘game of chicken’ ensues with Utah pulling the chute before both hitting the ground. At the end of the scene, Bodhi won the game of chicken. PM May made repeated attempts to push her negotiated Brexit deal through Parliament with unsuccessful (and some would argue humiliating) results despite pointing a metaphorical gun to Parliament’s head – using threats of a Hard Brexit, new elections, a new Brexit referendum, and the prospects of a long-drawn out delay that would produce no Brexit. But Parliament is refusing to pull the chute – as Brexiteer MPs refuse to cede ground on an open Irish border, payments into the EU budget, and guarantee of EU citizens’ rights. The EU appears to be emerging as the winning party in these negotiations: The longer the process drags on, the more likely a soft or no Brexit scenario is the outcome. However, any delay beyond April could result in the U.K. participating in European Parliamentary elections this May – not something the EU wants. The EU has been positioning for a hard Brexit scenario, despite the damage to German exports into the U.K. resulting from a no-deal Brexit. Given how Brexit is currently playing out, we overestimated the UK’s negotiating stance versus Europe – possibly because we underappreciated European concerns over the rise of populist movements. Contending with movements like Italian politics and France’s Yellow Vest protests, and facing the prospect of more populist party representation following this spring’s European Parliament elections, Europe is willing to risk a no-deal Brexit to get its member countries to toe the line. Unlike Point Break, however, it appears that all parties (May Cabinet, Brexiteers in Parliament, the EU) are willing to hit the ‘Hard Brexit’ ground rather than cede any more ground to the EU. But the conventional outlook now sees the new U.K. elections as the base-case scenario following the third defeat of May’s Brexit proposal. Brexiteers may now be facing a prospect of a soft or no-Brexit scenario, but at least they stood their ground even as they’re about to slam into it. Will China Pull the Chute on U.S. Trade Negotiations (and Prevent the World from Hitting the Ground)? China is reminding us again just how much of the world relies on its economic growth. 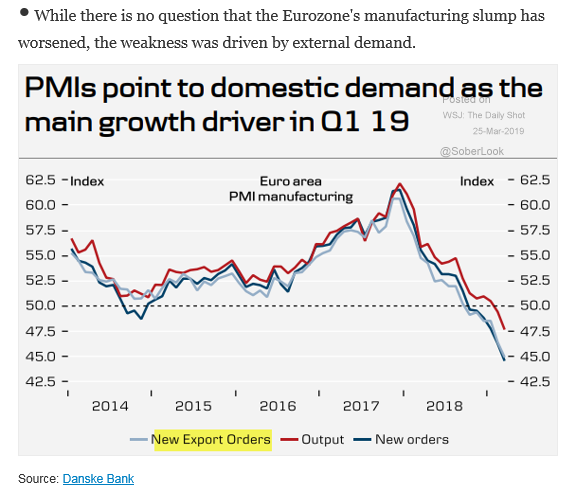 Global markets were spooked in early March following the release of manufacturing sentiment surveys (Figure 1) showing significant weakness across Europe (implied annualized European GDP growth is now down to 0.2%). Indeed, both Europe (primarily Germany) and Japan are experiencing more of the pain from a China slowdown. The U.S. is holding a tariff gun to Chinese imports while continuing to demand trade concessions around intellectual property transfer. The world is counting on China pulling the chute rather than serving as the proximate cause for the next major global contraction. 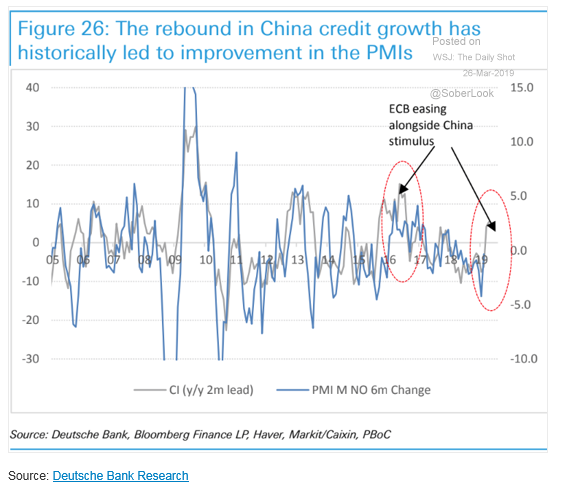 If China remains the weak link within the global economy, they might not be strong enough to pull the chute, although a recent rebound in credit impulse could point towards a second-quarter recovery (Figure 2). Longer-term, China’s debt leverage (318% of GDP) remains “stratospheric” despite efforts to boost economic growth. And should China face the day of reckoning on deleveraging to more sustainable levels, it could pose further deflationary risk on the global economy. The prospects for a new ‘Plaza Accord’ with China that would result in appreciation of the Chinese yuan versus the dollar have diminished, as China does not want to follow the deflationary path Japan experienced following the 1980s Plaza Accord. China isn’t the only reason both Europe and Japan are facing stagnant growth, despite their central banks’ commitments to maintaining zero (negative) interest rate policies and cheap access to bank liquidity. Germany’s car economy still suffers from the fallout over diesel-gate. And German taxpayers face the prospect of having to recapitalize a debt-encumbered Deutsche Bank-Commerzbank (NYSE:DB) (OTCPK:CRZBF) combination struggling with weak balance sheets and anemic profitability. Meanwhile, Japanese consumers face the prospect of yet another hike in their value-added tax. And Europe faces near-term prospects of a renewed populist uprising in Italy, as it suffers from low growth and high debt levels while trying to carve its own economic partnerships, like participating in China’s Belt-and-Roads initiative. As much as the U.S. does not want to partake in a global crash landing should China refuse to pull the chute on trade negotiations, the U.S. economy is in a relatively better position to withstand this compared to the rest of the world. Although revised down, U.S. real GDP grew 3% in 2018 and is expected to grow 2.4% in 2019 based on Bloomberg consensus estimates. The U.S. markets appear to be enjoying the Federal Reserve’s 180-degree pivot on monetary policy. Following the March meeting, the Fed struck a much more dovish tone on interest rates and balance sheet management than expected, resulting in a major decline in U.S. Treasury rates and an inverted yield curve out to 7-year maturities. Many have interpreted an inverted curve (10-year less 3-month yield) as a sign of an impending recession. More bullish economists like First Trust’s Brian Wesbury believe an inverted curve is just the market’s way of signaling to the Fed that short-term interest rates are too high, and not necessarily that recession is around the corner. However, it’s hard to argue with the bond market which seems to act as the tail wagging the Fed. Following the March Fed meeting, Fed Funds futures interpreted the Fed’s dovish stance as implying a possible rate cut by the year-end (Figure 3) to head off any impending slowness. Yes, the curve is inverted out to seven years, but the 10-2 year spread remains positive despite the decline in long-term interest rates (Figure 4), which imply slowdown but not recession. Despite the defensive positioning following the Fed meeting, credit spreads remain well-behaved, unlike the growth scare from 3Q2015-1Q2016 (Figure 5). BBB-rated corporate spreads have actually narrowed rather than widened – a strong indication that the macroenvironment remains conducive for taking on credit risk. Undergirding capital markets is the fact that global financial conditions remain loose (or are easing) rather than tightening (Figures 6 and 7) – typically economic contraction occurs as global economy succumbs to the weight of tighter financial conditions (central bank policy, tighter private credit). 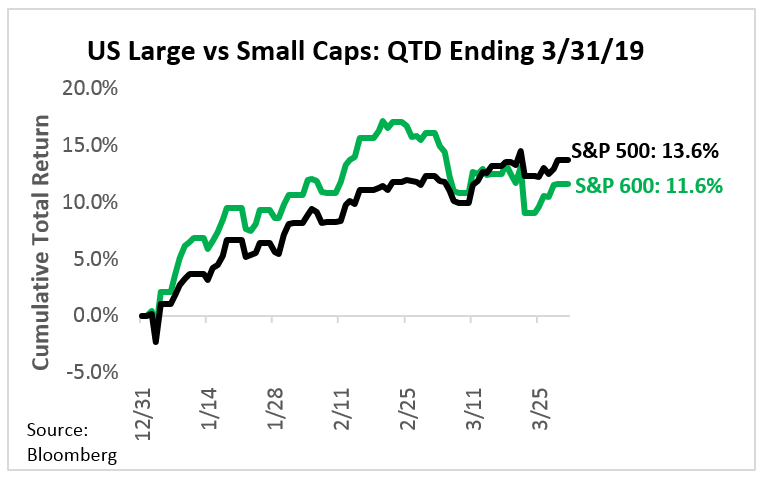 Hence, between the strong performance in U.S. large caps (small caps and value, not so much) and corporate credit, along with a bull steepener in the yield curve – we could be seeing a set-up for renewed risk-taking. Indeed, the market has been given the all-clear from the Fed that rates are not going up anytime soon, barring a major inflation scare. Will we see economic conditions improve enough for the Fed to resort to its path towards policy normalization? Investors need to see several macro headline issues resolved or at least clarified – including Brexit, European Parliament elections, U.S.-China trade negotiations. As well as the assurance that ongoing local issues surrounding emerging markets (Turkey, Argentina, Brazil) do not lead to broader contagion risk. Global stocks returned 1.3% led by the U.S. and Asia-Pacific ex Japan, up 1.9% and 1.5%, respectively; Emerging Markets, Europe and Japan lagged returning 0.8%, 0.6%, and 0.6%, respectively (Figure 8). 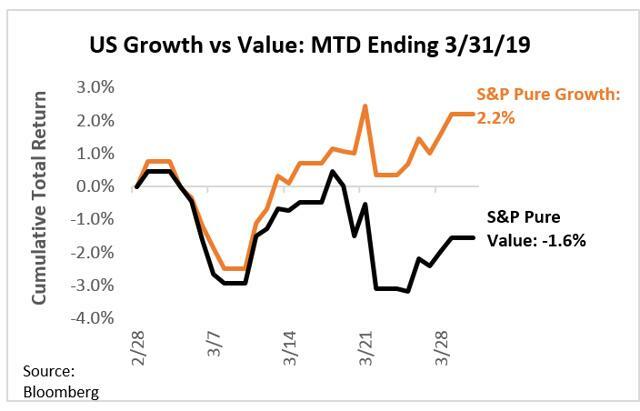 S&P 500 rose 1.9%, led by growth (technology, consumer discretionary) and defensive (real estate utilities) sectors while industrials cyclicals and financials lagged (Figure 9). S&P Small Cap Index was down 3.3% in stark contrast to U.S. large-cap performance, while S&P Pure Growth outperformed Pure Value (2.2% vs. -1.6%, respectively) (Figure 10). U.S. thematic, risk-based factors: Quality, Minimum Volatility, High Dividend, and Momentum outperformed the broader market; Value underperformed (Figure 11). 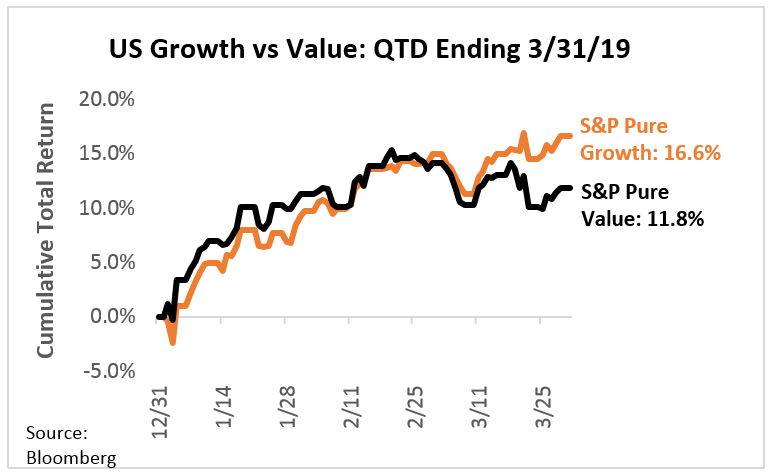 Investors ran for the high ground by seeking safety in low volatility and premium growth. Fixed income: U.S. fixed income benefited from a sharp drop in interest rates following the March Fed meeting. The Bloomberg/Barclays Aggregate Bond Index performed in line with U.S. stocks, returning 1.9% while U.S. High Yield returned 0.9% despite some credit spread widening (Figure 12). The 10-Year U.S. Treasury Yield dropped to 2.41% at month-end from 2.76% at the beginning of March, having dropped to as low as 2.37%, its lowest levels since mid-December 2017. Finally, U.S. REITs were a large beneficiary of the drop in interest rates. Commodities performed well with continued advances in oil prices. While precious metals lagged despite dovish central bank policy shifts. Additional disclosure: The above is the opinion of the author and should not be relied upon as investment advice or a forecast of the future. It is not a recommendation, offer or solicitation to buy or sell any securities or implement any investment strategy. It is for informational purposes only. The above statistics, data, anecdotes and opinions of others are assumed to be true and accurate; however, 3D Asset Management does not warrant the accuracy of any of these. There is also no assurance that any of the above are all inclusive or complete. Past performance is no guarantee of future results. None of the services offered by 3D Asset Management are insured by the FDIC and the reader is reminded that all investments contain risk. The opinions offered above are as April 1, 2019, and are subject to change as influencing factors change.